How to Fix Overexposed Photos? Save your valuable shots with PhotoWorks! Took an awesome shot only to discover that it's taken in too much light? Don't rush to hit the Delete button without trying to save the photo. 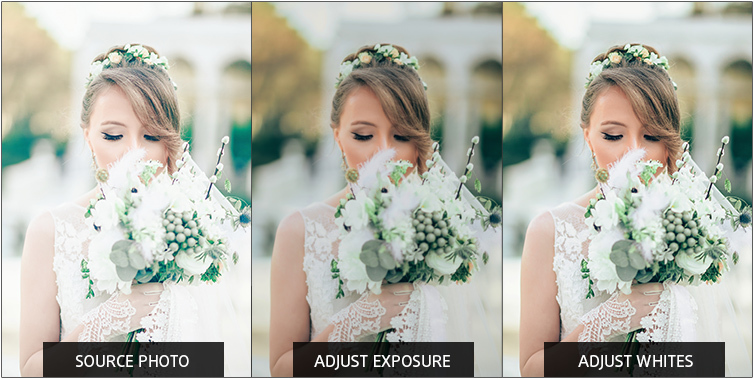 In this guide, we'll show you how to fix a picture that is too bright using PhotoWorks - this easy to use photo editor has a series of powerful tools to deal with lighting issues. Keep on reading to learn a few simple tricks that can help you save that unlucky shot. It's real hard to get the lighting right at times, especially when taking photos outside in sunlit weather. A camera (or photographer's) mistake will result in excessive brightness and lost detail. The tiny LCD screen on the camera back may not give you any hint of the problem, and you will often face it only when you're back home and open your pictures on the computer. 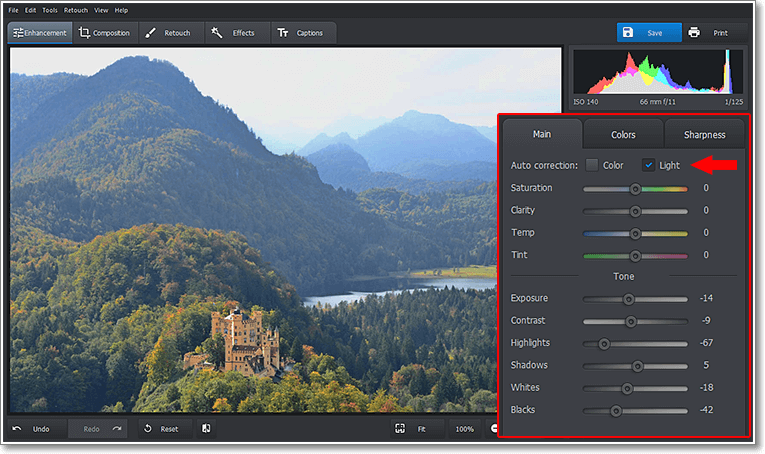 A decent photo editor will have a histogram - this helpful tool will show you whether your image exposure needs fixing. So what does this rainbow-like graph tell us? The horizontal axis of the histogram shows the tonal range of the photo, with dark tones on the left, midtones in the middle and light tones on the right. If you notice that most of the pixels in your histogram are piled up towards its right edge, and there's an obvious gap on the left, this likely means that your picture is overexposed. Even for a naturally light photo taken on a snowy day, there have to be some dark tones that make up the snow texture. If there are none at all, you'll see that gap towards the left edge which signals overexposure. Now how can you fix overexposed photos? Here are a few basic tricks. Open your picture in PhotoWorks. In the Main tab on the right, you'll find the Auto Correction option. Check the Light box next to it, and with a bit of luck the software will cope with the task by itself. 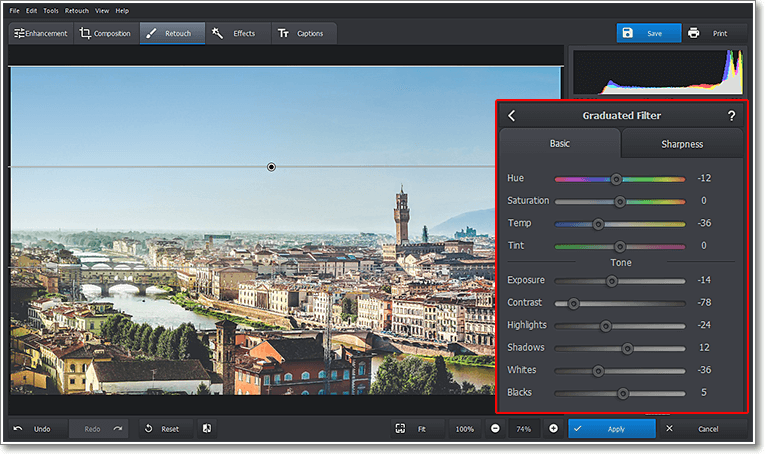 The image enhancement engine will discover most of the standard issues and adjust the tonal range accordingly. But you certainly know that photography is all about your own vision, and you probably want to set your own accents here and there. This is why automatic correction may not completely satisfy you. If this is the case, let's move on. In the right hand panel, find the Tone section – this is where all the vital lighting controls are located. Drag the Exposure slider to the left until the photo looks good to you. As you drag, you'll notice the histogram creep to the left. Dragging the same slider to the right will ligthen the image – it's good to know that in case you need to make a dark picture brighter. You should be extremely careful with the Exposure setting since the changes are applied to each and every pixel in the photo. As you lower the overall exposure, the darker areas are affected too, getting even darker, which may be undesirable for you. 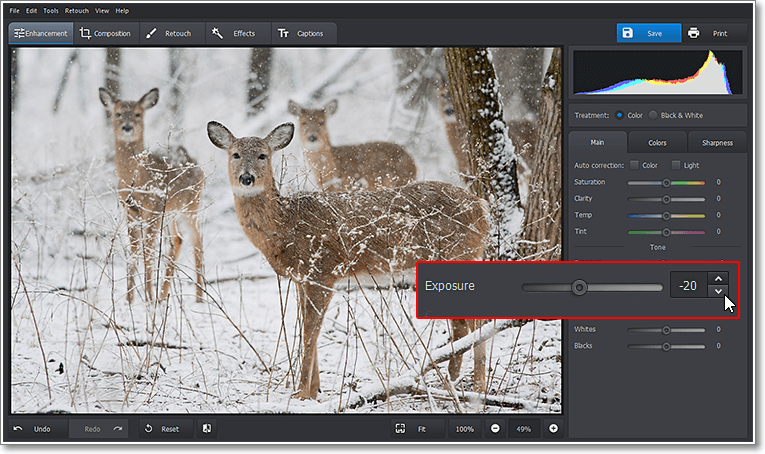 Now let's learn how to edit overexposed photos in a smarter way. The Whites and the Highlights sliders allow you to work with bright areas only, without touching the dark ones. Take a look at the example below. First, we tried the Exposure setting – dragging it to the left reduced excessive brightness, the photo became clearer but somewhat gloomy. We obviuosly want a bride's photo to be light and airy. So we decided to adjust the Whites instead. Again, we dragged the slider left – this helped us get rid of the extreme whites without affecting the natural tone of the entire image. The Highlights setting is even more delicate than Whites – it lets you work with a wider range of light pixels. Dragging the Highlights slider to the left lets you recover lost detail. We tried to demonstrate that in the image below. The shot was made on a sunny winter day, and the wrong ISO resulted in overexposure. First we lowered the Whites to fix overexposure, but the photo still seemed a bit too bright. Tweaking the Highlights helped us bring back detail and add depth to the girl's face. When playing with the settings in the Tone section, you'll naturally find Shadows and Blacks helpful as well – use them to boost the darker parts of the shot in order to add contrast and depth. A most common problem with landscape photos is the washed out sky. It's hard to avoid even for experienced photographers, just because the camera sensors have difficulty capturing the entire range of tones that a human eye can see. If the bottom part of your landscape is just perfect but the sky is too bright, PhotoWorks lets you save the sky with the Graduated Filter found in the Retouch tab. To apply the filter, hold the left mouse button down and drag the filter over the area you need to work with – in our case, from the top edge down covering the sky. Now tweak the Tone settings just as we did it for the entire image, as well as the Temperature setting to improve the white balance. This time, the changes are applied to the selected region only, without affecting the land. 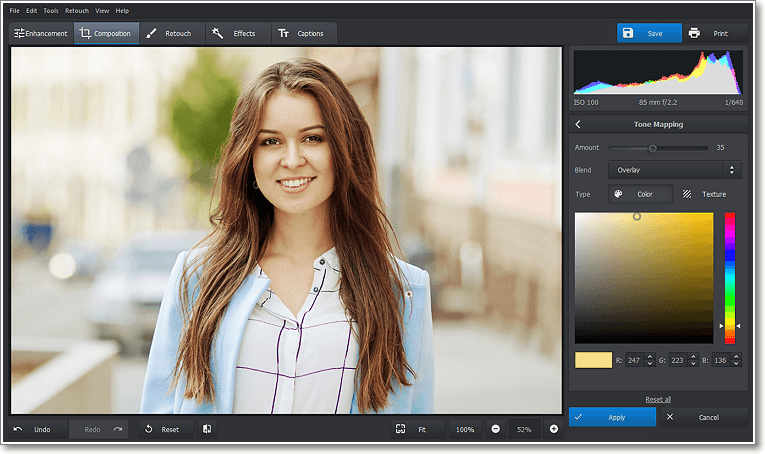 Discover even more effective tools of this powerful software and take a step to becoming a photo editing guru! Experiment with your photos - change tones, add stylish captions, create Polaroid-like effects, and more! Download PhotoWorks to Save Your Pictures! Now you know how to correct overexposed photos, it's high time to download PhotoWorks and put your knowledge into practice. Save your valuable shots in a few clicks!